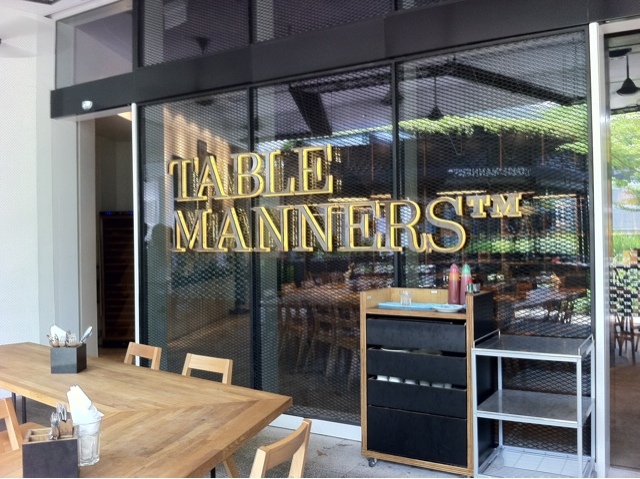 Table Manners is the latest venture from the team behind Bar Stories at Haji Lane. Bar Stories deserves a post of it's own - it's one of the most unique and memorable bars that I've visited, in any of the cities that I've lived in. It's sister outlet, Table Manners, has a unique selling point - the creativity of Bar Stories combined with the coffee crafting expertise of Papa Palheta. This would be a potent combination in any part of Singapore, but particularly so in an area that until recently has been starved of quality coffee. As always, I ordered an espresso and a cappuccino, two drinks that tell me a lot about the quality of coffee in any given cafe, bar or restaurant. The espresso shot was thick, with definite hints of citrus. This gave rise to a full bodied aftertaste that lingered long after the last drops of espresso had been gulped down. It seemed thicker and more potent than a regular shot - more akin to a ristretto - this was a shot that was extracted for the correct eighteen to thirty second extraction time. This may seem like a minor point, but it's an important one - it's harder to make bad coffee with a good espresso foundation. The shot had a medium dark crema, which lined the side of the cup. 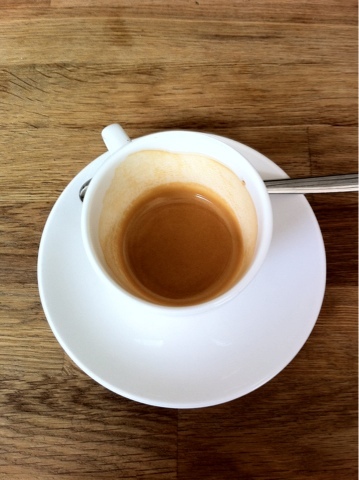 It's interesting to note that a lot of the perceived bitterness in an espresso shot comes from the crema itself. If you carefully scoop the crema from a fresh espresso shot, it should taste extremely tart. Crema which clings to the side of a cup will not impart as much of this sharp flavour to a shot. This was a good shot by any standard, but it would also be a good shot for anyone who has not tried espresso shots before, or for anyone who has been turned off espresso by bad shots in franchise chain cafes. 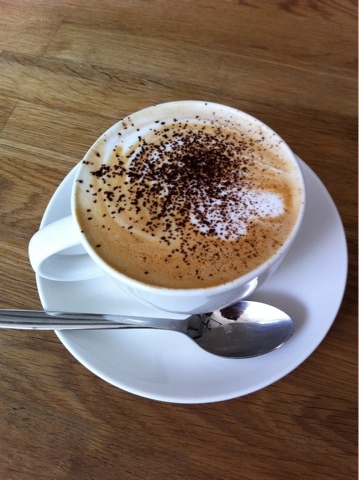 The cappuccino has a thin layer of foam, closer to that seen on a latte. As a result, the smooth and silky mouthfeel was reduced, making this a lighter cappuccino (I prefer mine stronger), but the quality of the drink was not overly diminished. The use of Papa Palheta beans is a clever choice for this drink - the lingering aftertaste ensures that the coffee flavour is not lost, and that this remains a quality coffee. One negative point however is that the coffee cups used are very thin, so that drinks tend to go cold much more quickly as a result. It's worth pointing out that coffees in Table Manners are notably less expensive﻿ than those in franchise chains. Why waste good money on bad coffee when Table Manners has Papa Palheta's beans? Latte art is always a welcome sight, as it tells me that the baristas were trained to a high standard, and trained to care about quality coffee. This is consistent with my comments on the espresso shot being prepared correctly. The light dusting of cocoa powder ensured that little sweetness was imparted, and that the cocoa flavour accentuated rather than dominated the drink. The food menu is worth a mention also - there is a good selection of starters, main courses and deserts, and an interesting menu that allows items to be paired according to the customers preferences. The prices are fair - they are certainly not overpriced - another point in their favour. In a nutshell, the bright young staff at Table Manners are serving up quality coffee, made from quality beans in a quirky and interesting bar and restaurant. Bar Stories younger sibling is already off to a good start.